If you're looking for a reason to dispel the proposed changes to the July recruiting period, look no further than Jalen Graham. Entering Peach Jam, Jalen Graham held zero scholarship offers. After watching him perform at Peach Jam, that previous statement is stunning. And also no longer true. Team WhyNot's big man exploded onto the national scene in North Augusta, putting together a series of eight performances that has led to a major uptick in his recruitment, including his first offer from Grand Canyon State and a bevy of interest from high-major schools. 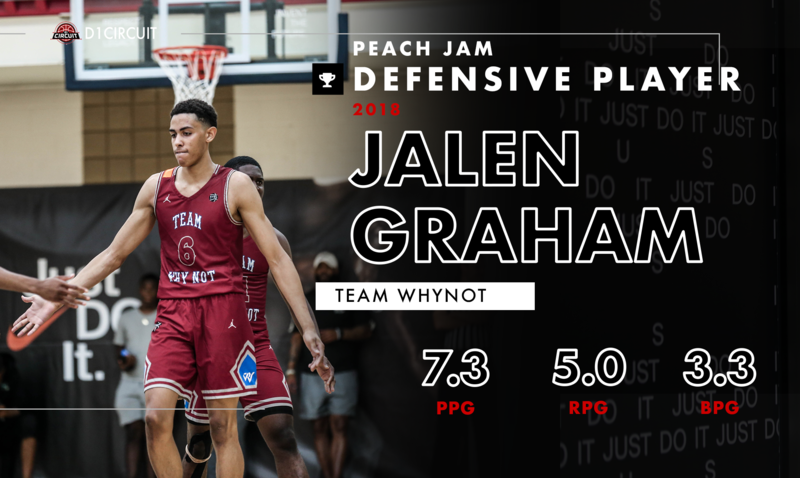 WhyNot's biggest red flag heading into Peach Jam was their lack of inside productivity, and Graham took that criticism personally. Offensively, the 6-foot-9 big man averaged 7.3 points, 55.1 FG% and 3.0 assists. He was consistently active, aggressive on the boards and finished around the basket at a 55.1 percent clip. Graham's offense was much-improved, but it was massively outshined by his defense. WhyNot's big man averaged 3.3 blocks per game, showing off a non-stop motor and natural timing ability that caught the eye of national scouts across the board. Graham proved his ability to rim protect without getting into foul trouble, and was a pest in the passing lanes, tallying just under two steals per game. Graham's presence down low allowed the rest of the lineup play more aggressively, and it paid off in a big way. Russ Westbrook's WhyNot held AOT, the league's highest-scoring team, to eight points below their 77.7 PPG average. They also put the clamps on Team United and the Oakland Soldiers in bracket play, and Graham was a key cog. Graham is a terrific example of the power of the Peach Jam. July's premier grassroots tournament provides underrated players a platform to blow up, and Graham did just that. The budding senior will star for Mountain Pointe (AZ) high school in the winter, and will have a lot of new eyeballs breaking down his game. "I've been hearing from Illinois, Montana, Fresno State, Kansas State, GCU, a lot of others," Graham told Rivals' reporter Krysten Peek at Peach Jam. "It' amazing. I got my first offer yesterday (from GCU)." Now that his recruitment is picking up, Graham is focused on one thing; winning. "I just want to win," Graham explained. "Everyone wants a winner on their team. We just need to keep winning." He has several visits lined up in his head, but nothing official to date. "I want to visit Boise State, Pepperdine, Santa Clara, USC would be cool too." Graham said.